The hand salute is a one-count movement. The command is Present, ARMS. When wearing headgear with a visor (with or without glasses), on the command of execution ARMS, raise the right hand sharply, fingers and thumb extended and joined, palm facing down, and place the tip of the right forefinger on the rim of the visor slightly to the right of the right eye. The outer edge of the hand is barely canted downward so that neither the back of the hand nor the palm is clearly visible from the front. The hand and wrist are straight, the elbow inclined slightly forward, and the upper arm horizontal. 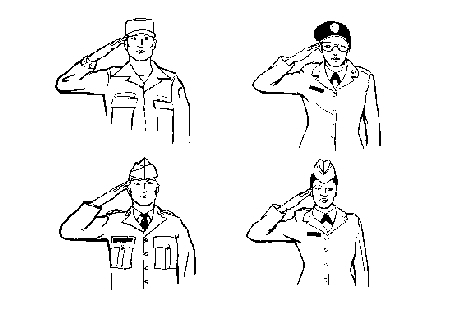 When wearing headgear without a visor (or uncovered) and not wearing glasses, execute the hand salute in the same manner as previously described in subparagraph a, except touch the tip of the right forefinger to the forehead near and slightly to the right of the right eyebrow. 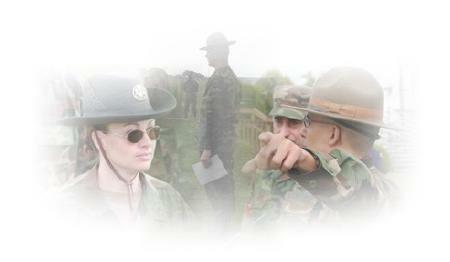 When wearing headgear without a visor (or uncovered) and wearing glasses, execute the hand salute in the same manner as described in subparagraph a, except touch the tip of the right forefinger to that point on the glasses where the temple piece of the frame meets the right edge of the right brow. Order arms from the hand salute is a one-count movement. The command is Order, ARMS. On the command of execution ARMS, return the hand sharply to the side, resuming the position of attention. When reporting or rendering courtesy to an individual, turn the head and eyes toward the person addressed and simultaneously salute. In this situation, the actions are executed without command. The salute is initiated by the subordinate at the appropriate time and terminated upon acknowledgment. The hand salute may be executed while marching. When double timing, a soldier must come to quick time before saluting. NOTE: When a formation is marching at double time, only the individual in charge assumes quick time and salutes. The platoon renders courtesy during ceremonies or when marching past the Colors by executing eyes right. The commands for this movement are Eyes, RIGHT and Ready, FRONT. At the halt, all men (on the command of execution, RIGHT), while keeping their shoulders parallel to the front, turn their heads and eyes to the right at a 45-degree angle. They focus on and follow the person passing to the front until they are again looking forward, at which time their heads and eyes remain fixed to the front. Only the platoon leader renders the hand salute. When marching, the preparatory command Eyes is given as the right foot strikes the marching surface and the command of execution RIGHT is given the next time the right foot strikes the marching surface. On the command of execution RIGHT, all men, except the right file, turn their heads and eyes to the right and align themselves on the right file while continuing to march. Men in the right file do not turn their heads and eyes but continue looking straight to the front and maintain correct distance. Only the platoon leader salutes. To terminate the courtesy, the preparatory command Ready is given as the left foot strikes the marching surface, and the command of execution FRONT is given the next time the left foot strikes the marching surface. On the command of execution, the men turn their heads and eyes sharply to the front and the platoon leader terminates the hand salute.